Business Account provides a dedicated page for the registration of professionals. Additional required fields for the user and a specific email at registration is sent to the merchant. Assigns automaticaly a customer in a specific group. The Business To Business (B2B) market is essential, it is necessary to offer an offer dedicated to the specific needs of your business customers. 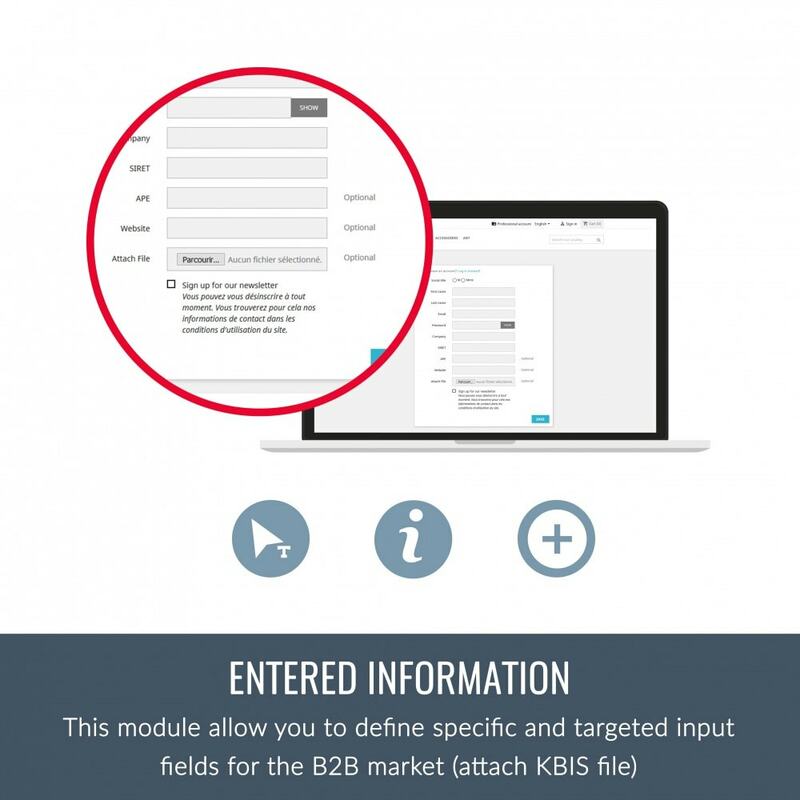 The B2B Business Account module allows you to set up the creation of specific business accounts with broader possibilities than a basic account. It allows to have a space dedicated to professionals, adapting to their needs. The Business Account defines a CMS page that contains information related to the interest and benefits of creating a business account. The administration of this CMS page allows you to detail the information prior to a registration of your customers for the B2B market. By configuring these accounts for the B2B market, you have the ability to manage the display of form fields to suit your business customers. 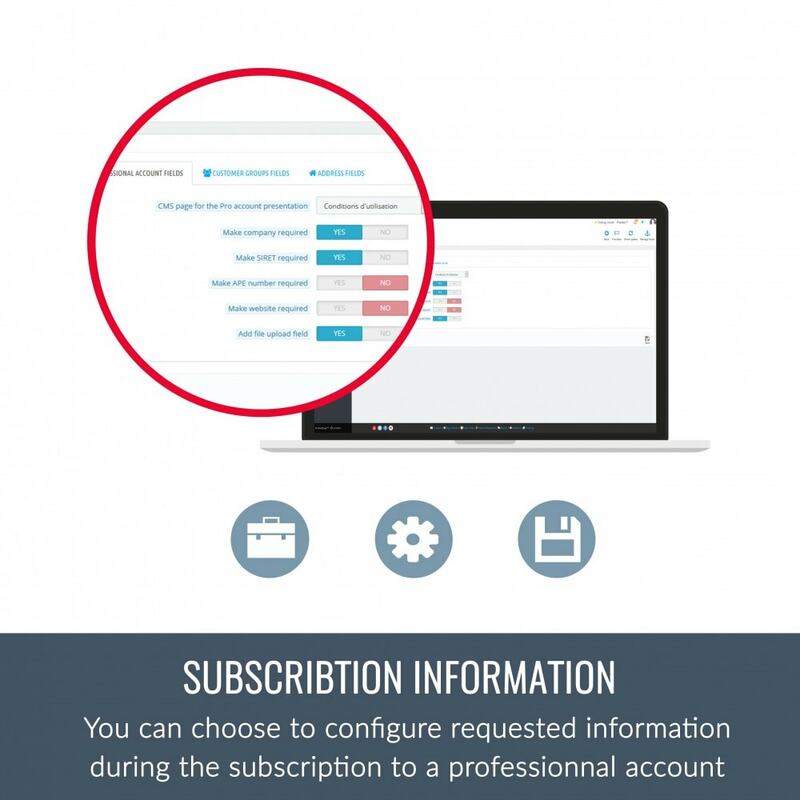 By building your registration form for the business accounts, you can define the optional and mandatory fields. 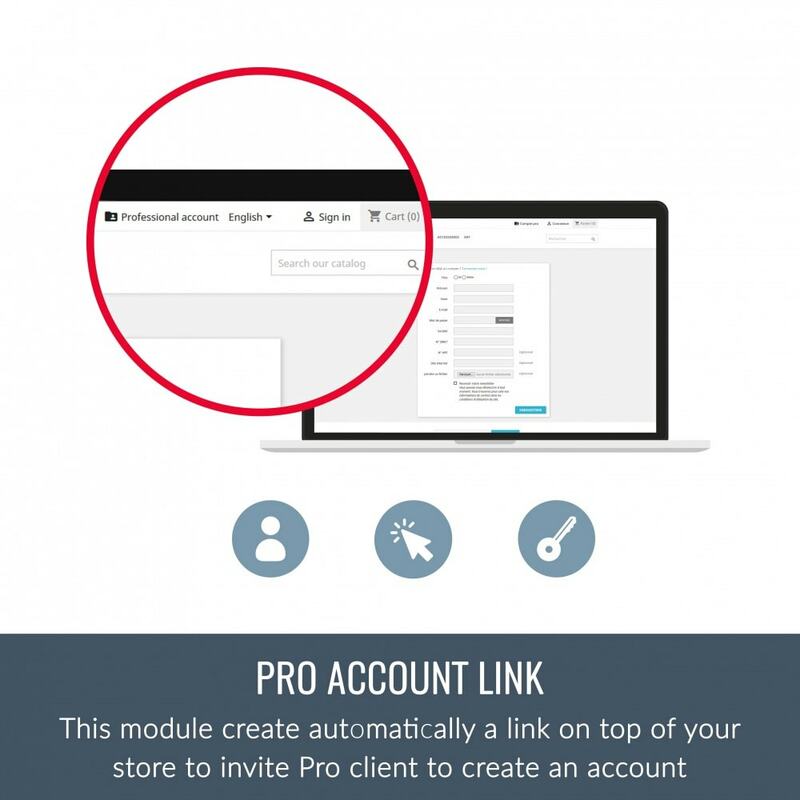 This customization allows you to adapt the Prestashop B2B mode to your industry. 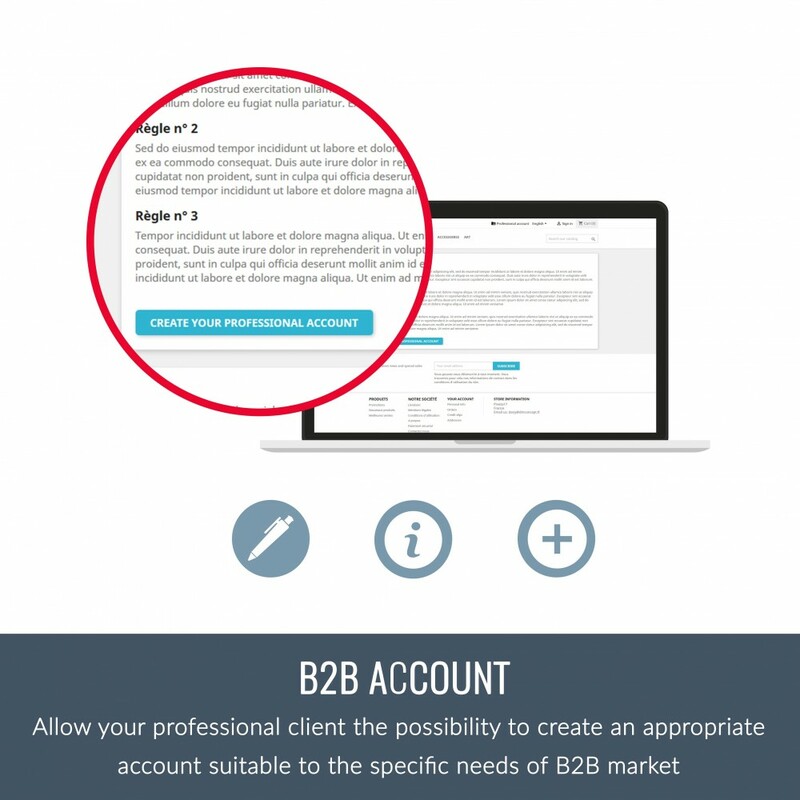 You adapt to the needs of your B2B market by allowing your customers to create a professional account. To register, they must complete certain information specific to their status (SIREN, SIRET, name of the company, APE, website, etc.). You can also allow your business customers to send you an extra file when they register (for example, sending KBIS). By offering a differentiating registration to your professional clients you will get better customer satisfaction, and increase your conversion rate for the B2B market. VAT1 Dual display of prices tax excl. and tax incl. The LyoShowVATFree PrestaShop module shows both the tax included price and the tax excluded price. 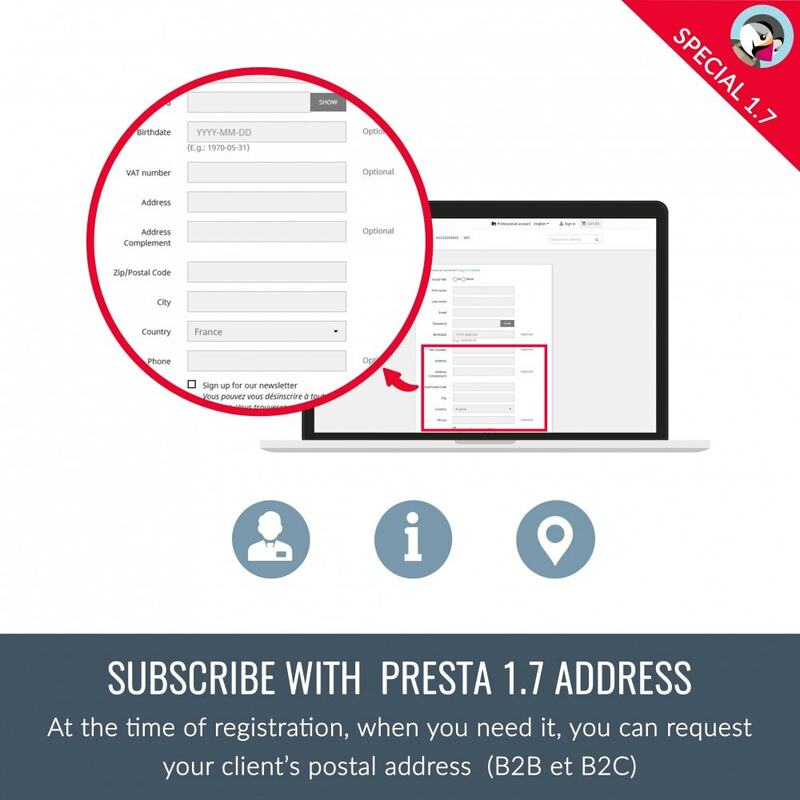 The B2B Business Account on your store allows you to create a landing page containing the list of benefits related to specific registration as a professional. 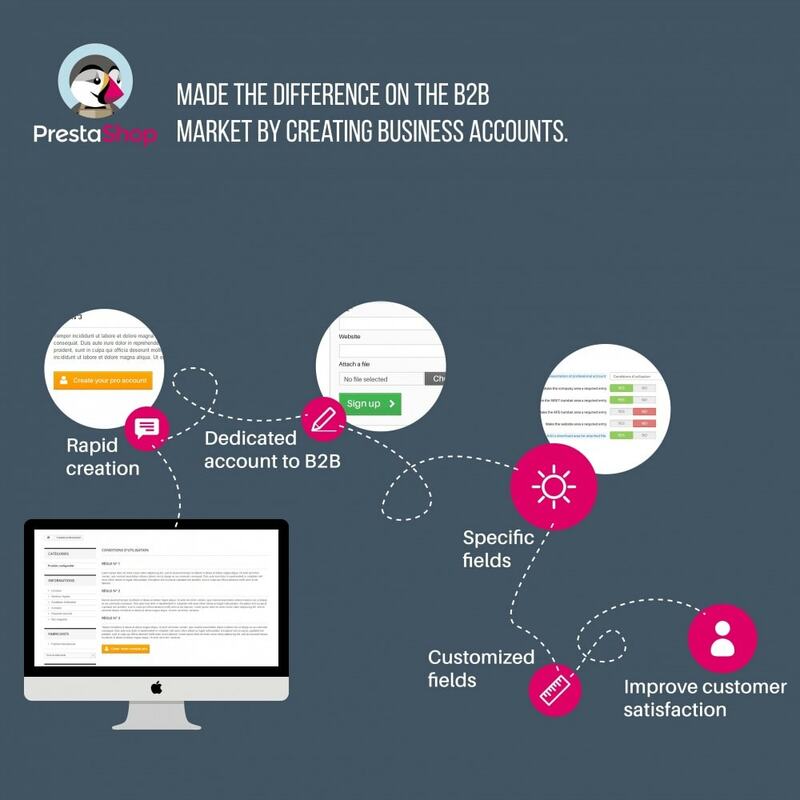 Your customers will be able to see the benefits of this business account.This page is customizable based on the benefits you want to assign to your B2B customers. Your customers will feel privileged as professionals since their needs will be taken into account as soon as they register on your Prestashop e-commerce store. The registration page will allow them to identify themselves as a professional by verifying information related to their company. After registration, the customer is automatically assigned to the group you have defined.This automatic assignment can be disabled! Make available custom products !Revolution avoiding duplicative combinations ! The customer see price updated in real time according to his choice. Send emails to your customers directly from the customer form, and manage threads from the “Customer Service” panel. Sharebox: Share files with fun ! Sharebox allows your customers to share files and documents when ordering and in their customer area. Administration of available formats, groups with access to functionality.